Natural gas must be provided at about ambient temperature and be gaseous for its use, e.g. for driving a combined heat and power plant (CHP). Normally, LNG evaporates in an air evaporator absorbing heat from the environment. High-value cold is lost to atmosphere. The LNGcold advancedREGAS system recovers deep cold down to -60°C warming up LNG to be regasified and provides the recycled cold energy for external use. No other heat source like sea water or burned gas is needed, and no CO2 is emitted. The LNG temperature is increased, icing is significantly reduced. The recovered cold energy is transferred without an electric compressor solely by heat transfer from the vaporised gas to a brine circuit that can supply multiple consumers with different effective temperature levels. Due to the use of stainless steel in the essential components, high operational reliability and system availability are ensured. The LNGcold advancedREGAS system has very few moving parts and is therefore virtually maintenance-free. All components are manufactured in Europe, according to European standards and certified by a notified body. Expensive maintenance requirements resulting from the F-Gas Regulation (Regulation (EU) no. 517/2014 on fluorinated gases) are not an issue because only “waste cold” is used, which would otherwise have been released into the environment. Furthermore, refrigerants with ozone depletion and global warming potential can be avoided completely. 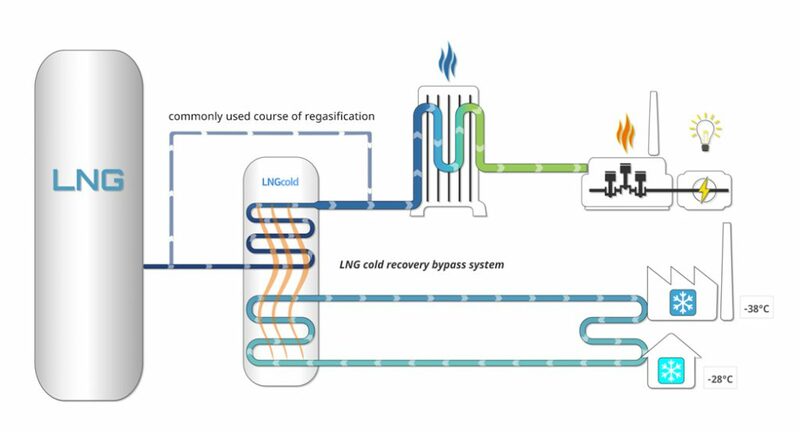 The LNGcold advancedREGAS system is connected as bypass to new or existing regasification installations. It disposes of an own control system, which may work independently or be integrated in the main control system of the regasification plant, and a remote control option. Regasification cold by Eco ice does not need mechanical compressors. There is only one pump for circulating the brine, which operates very quietly. The vibration of mechanical compressors, often a nuisance for users, is not a concern with the LNGcold advancedREGAS system. Parts of the technology described here were developed by the company Eco ice Kälte GmbH. The Eco ice business unit cold recovery from liquefied cryogenic gases has been transferred to and will be further developed by LNGcold solutions GmbH.